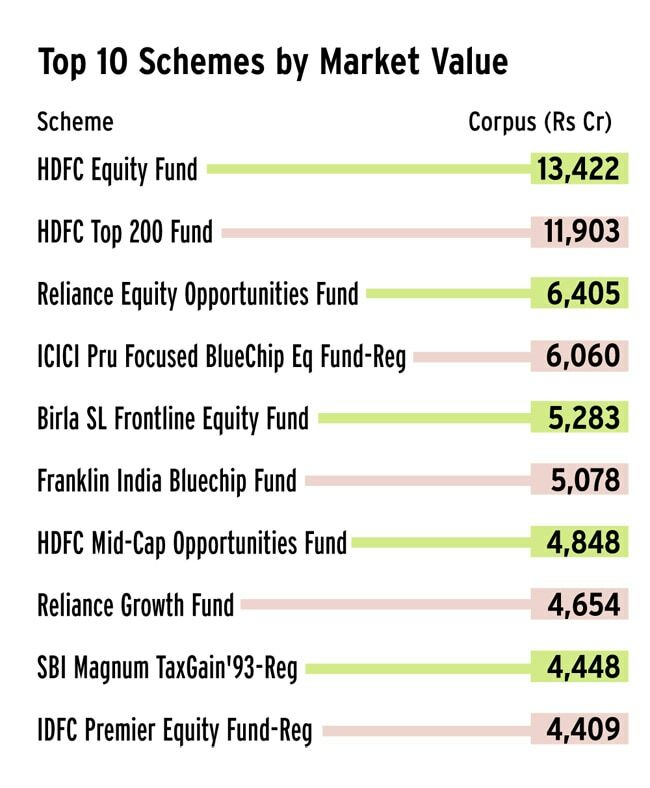 An analysis of what equity mutual funds have been buying and selling of late. The formation of a stable government at the Centre has lifted stock markets out of years of stupor. The Bombay Stock Exchange (BSE) Sensex has, as a result, risen 20% since January; it touched a high of 26,190 points on July 8. This, in turn, has put life back into the mutual fund industry. According to the Securities and Exchange Board of India, or Sebi, the industry's assets under management, or AUM, crossed the Rs 10 lakh crore mark in May, up 7% from Rs 9.45 lakh crore in April. Let's look at sectors and stocks which equity mutual funds have been buying and selling of late to get clues about their expectations from the stock markets. According to Sebi data, banks are the top asset in portfolios of equity funds; they have invested Rs 48,000 crore in banks, 22% of their total deployment. Banks were under a lot of pressure till a few quarters back due to rising interest rates and piling up of bad loans. That's why the funds pared allocation to the sector. However, this changed a few months ago after inflation eased a bit and economic growth showed signs of picking up, improving banks' asset quality. Sankaran Naren, CIO, ICICI Prudential AMC, says the risk of a high current account deficit, too, is fading, which means banks, which usually benefit when the economy improves, will do well. A fall in interest rates and inflation may further encourage funds to add bank stocks. Naren manages one of the largest equity schemes, ICICI Prudential Focused Bluechip fund, a large-cap fund with assets of Rs 6,000 crore. The fund increased exposure to banks from 21% in January to 27% in May. The two largest equity schemes from the HDFC stable, HDFC Equity fund and HDFC Top 200 fund, which together manage Rs 25,000 crore, also reflect this trend. 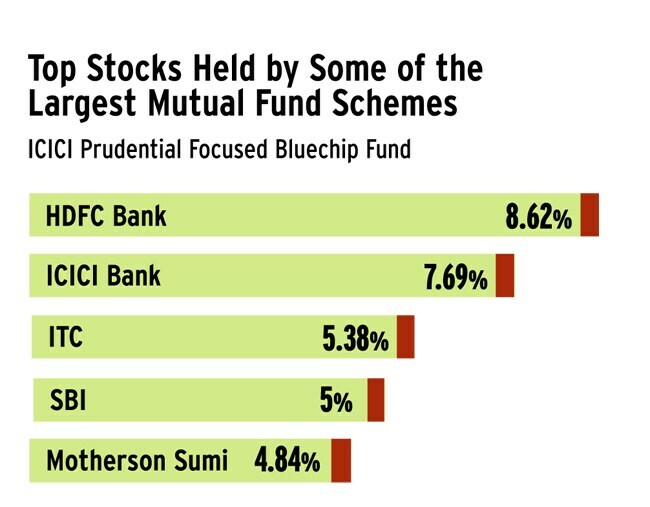 Banks account for 26% assets of HDFC Equity fund, whose top picks are SBI (9%) and ICICI Bank (7%). These two are the top picks of HDFC Top 200 too. One reason for the increased exposure is the sharp rise in bank stocks in the last few months. ICICI Bank, for instance, rose 20% in April. The next favourite sector of mutual funds is information technology or IT (10%), followed by pharmaceutical (7%), finance (5%), consumer non-durables (5%) and automobile (5%). 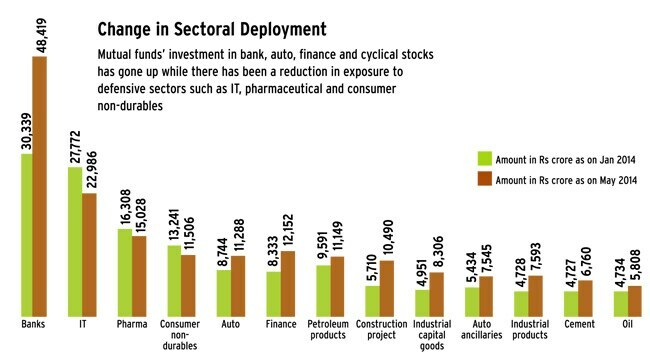 Although defensive sectors such as IT, pharmaceutical and consumer nondurables still account for a big chunk of funds' assets, their overall contribution has fallen since the start of the year (See Change in Sectoral Deployment). This is in contrast to auto, finance, construction project, industrial capital goods and cement sectors, whose share has risen significantly since January. The decline could be because of the recent change in investors' preference for high-beta stocks. High-beta stocks are those that move more than the overall market. These are the opposite of defensive stocks, which are stable and so in demand when stock markets are under pressure. Naren says among the three components of gross domestic product (agriculture, industry and services), industrial growth could see the maximum traction, which should drive earnings and stock prices over the next three years. Further, the government's thrust on infrastructure will boost power generation and road construction and provide cascading benefits to manufacturing and services sectors. In fact, many projects stuck at various stages will be the first beneficiaries of this trend. The new government is expected to reduce stress in the financial sector, revive capital expenditure, get stalled projects going, remove investment bottlenecks and increase investment in railways & roads. The finance ministry estimates that lack of good infrastructure has been holding back economic growth by 1.5-2% points every year. This is likely to change and, hence, bring enormous benefits to companies allied to the infrastructure sector. Going by this view, besides banking, ICICI Prudential Focused Bluechip fund has increased exposure to power utilities and construction project company Larsen & Toubro and halved exposure to pharmaceutical (from 7% in January to 3% in May). Exposure to IT is down from 17% to 12%. Naren says these changes did not happen due to election results. This was a gradual process that started once the country's current account deficit started falling. "We saw opportunities in domestic cyclicals and reduced exposure to metals and global cyclical stocks," he says. 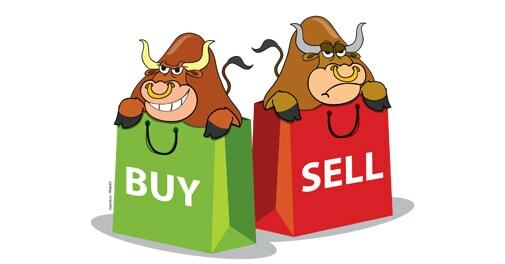 Domestic cyclicals are companies whose stock prices are affected by ups and downs of the overall economy. These sell items which people buy more when the economy is booming and can cut back on during recession. The sectors include infrastructure, capital goods, engineering, cement, auto and banking. Global cyclicals are companies in IT, pharmaceutical, material and oil & gas sectors. The fall in IT sector exposure could be due to rising rupee and lower earnings guidance given by most IT companies for the year. 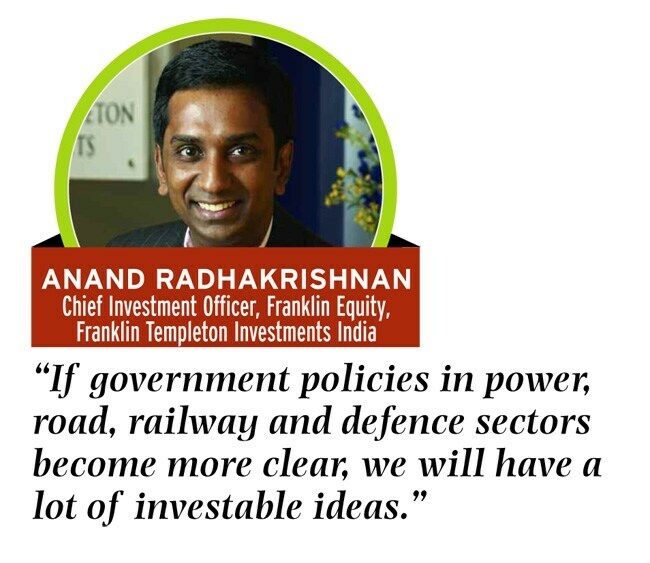 Anand Radhakrishnan, chief investment officer, Franklin Equity, Franklin Templeton Investments India, says many infrastructure stocks have been punished because of the huge debt on books of these companies. Besides, slowing economic growth has been especially tough on these companies. If the macro environment improves and interest rates fall, the burden on their balance sheets will come down and the stocks will start to deliver better returns. "Further, if government policies in power, road, railway and defence sectors become more clear, we will have a lot of investable ideas," he adds. Among the large schemes, Reliance Equity Opportunities, too, has increased exposure to domestic cyclicals. Sunil Singhania, CIO, equities, Reliance AMC, says the fund was fairly invested in capital goods companies before elections as their valuations were lower than that of consumer companies. After elections, the propensity to invest in the domestic sector has gone up owing to expectation of improvement in the economy, he adds. He says a big shift in sector preferences seems to have occurred due to an increase in stock prices and not entirely due to selling or buying of shares. The fund has a 13% exposure to pharmaceutical, which Singhania still believes in, while its exposure to IT has fallen. Commenting on valuations after the recent rise in stock prices, Singhania says past profits (trailing P/E) are not the correct way to judge the present stock prices since the environment was not conducive then. Valuations, he says, must be based on future profits, which are expected to rise. 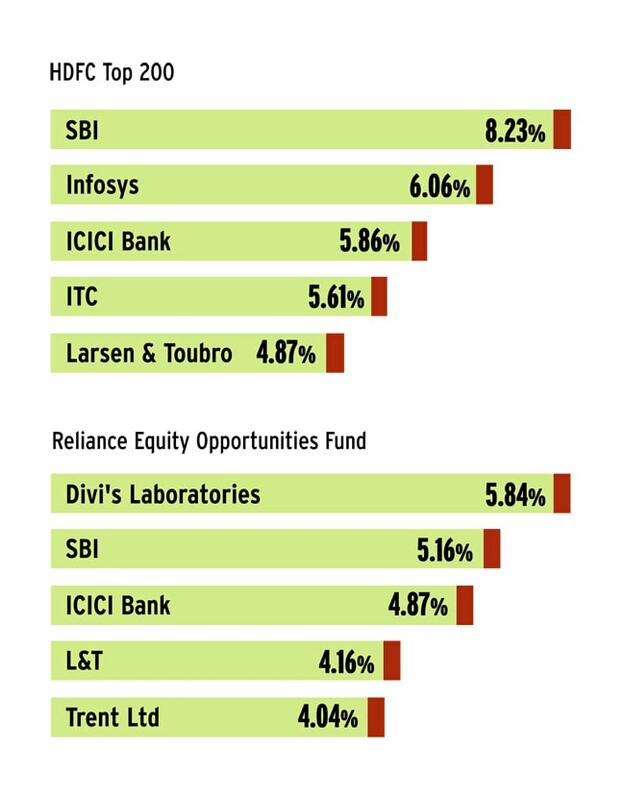 ICICI Bank is the largest contributor to assets of equity mutual funds (Rs 12,700 crore, as against Rs 10,000 crore in April), followed by HDFC Bank (Rs 9,000 crore) and State Bank of India (Rs 8,400 crore). 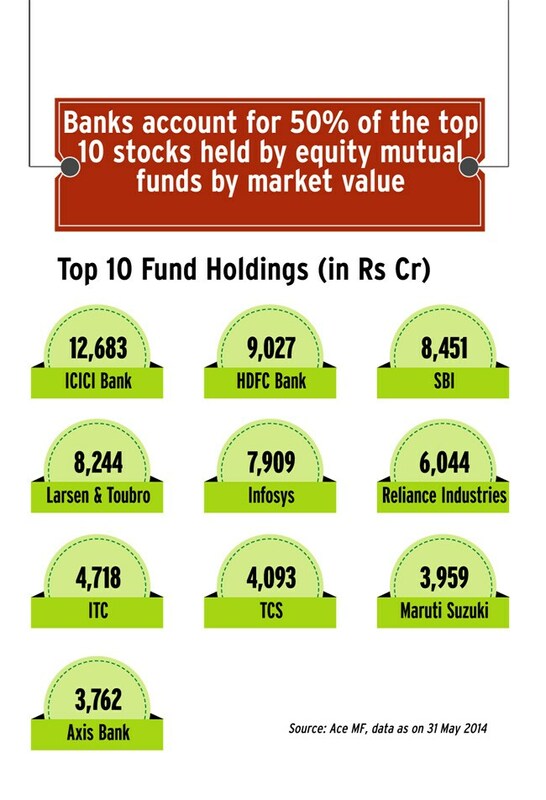 Banks account for 50% top 10 stocks held by mutual funds by market value. Larsen & Toubro has taken the fourth place by contributing Rs 8,200 crore (from Rs 6,600 crore in the previous month) owing to a sharp surge in its stock price. Infosys, used to ruling the roost, has fallen to the fifth place (Rs 7,900 crore). Reliance Industries has slipped owing to slow rise in its stock price. ITC, too, has lost its place as funds are shying away from consumer companies and focusing on cyclicals. The exposure to TCS is Rs 4,100 crore. The figure for Maruti and Axis Bank is Rs 4,000 crore each (See Top Stocks Held by Some of the Largest Mutual Fund Schemes). Investors must note that most of the above stocks account for a large part of mutual fund portfolios since they have a high weight in benchmark indices as well. One of the largest equity schemes by market capitalisation, Birla Sun Life Frontline Equity, which manages Rs 5,300 crore, is benchmarked against the BSE 200 index. "There would be sector weight deviation vis a vis the benchmark of not more than 3% absolute or 25% over the sector or portfolio weights, whichever is higher," says Mahesh Patil, Co-CIO and fund manager, Birla Sun Life Frontline Equity fund. This means if the weight of the banking sector in the benchmark is 10%, the fund will invest 7-13% funds in bank stocks. Clearly, hope of a turnaround in the fortunes of the economy after the elections would have led mutual funds to increase exposure to many sectors. "While it is good for investors to know the stocks bought and sold by mutual funds, they may not follow it for their direct equity portfolio considering that funds buy/sell at different prices and are adept at tracking them," says Gaurav Mashruwala, a certified financial planner. The job, he says, is best left to fund managers.